The new navigation menu will give you continuous access to your most recent items, your favorites, the Home screen, and the Solution Center. 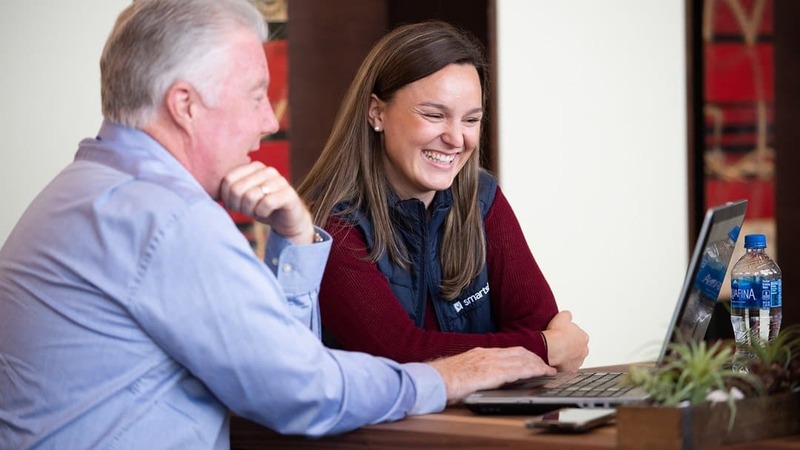 The Solution Center is the place to kick off your new work: click on its icon when you want to download templates, create new Smartsheet items from scratch, or import data. I want to focus on the new recents list, though, because it’s something that many of you have specifically been requesting for a long time. 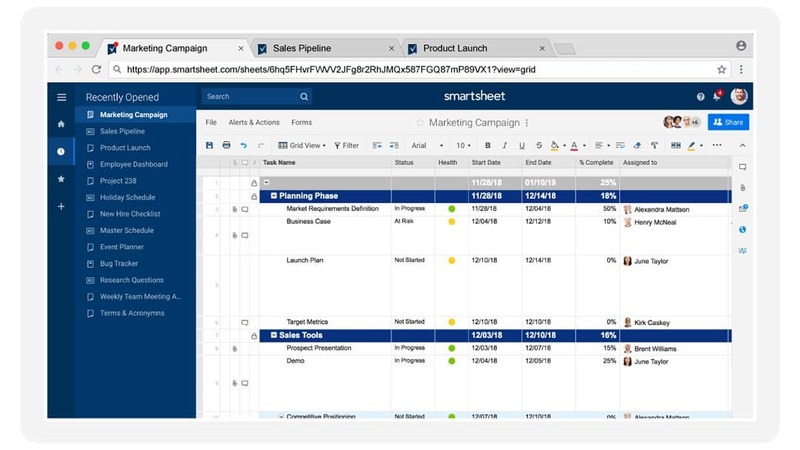 Take a quick look at Smartsheet on your computer. How many tabs are visible? Most of our customers can see fewer than 10 tabs at the same time on their desktop, with their other recently viewed items located in the overflow menu (the “...” tab). As the number of items in that overflow menu grows, it can be a challenge to quickly access your work. In the new navigation menu, the recents list will display up to 20 of your most recently viewed sheets, reports, and dashboards. And the basic order is more intuitive: you’ll find the most recently viewed items at the top of the list. When you have particularly important recently viewed items, you’ll be able to go a step further: pin items above the list for persistent, easy access. Before I talk about Smartsheet tabs, there’s a related, important change that we’re introducing on the same day. Have you ever tried to share your Smartsheet work by copying the URL straight from the address bar? Don’t worry, you’re not alone. It happens all the time to new Smartsheet employees, too. The reason that you can’t currently share your work that way is because almost all Smartsheet items display the same URL (https://app.smartsheet.com/b/home) in the address bar. Moving forward, the address bar will display direct links that are more reflective of what you’re actually viewing in Smartsheet. These links will include permanent, unique IDs for each sheet, report, dashboard, folder, and workspace. In addition to incorporating these unique IDs, direct links for sheets and reports will specify other key attributes like current sheet view (grid, card, Gantt, and calendar) and applied filters. The addition of direct links will offer some immediate benefits. First, you’ll be able to copy and paste links straight from the address bar. When you paste the link into an email, team portal, Slack channel, or wherever is most convenient for your team, they’ll be able to access that item. The same permission rules will apply so sharing these links will be a secure option. Having direct links in the address bar will also make it easy to bookmark your work in your browser. In fact, you’ll be able to bookmark Smartsheet items exactly as you would any other web page. Direct links will ensure that you view shared and bookmarked Smartsheet items in the intended way. You’ll no longer need to spend time documenting and following setup instructions (e.g., “Switch to card view. Sort the cards by status. Apply this filter.”) because the link will automatically incorporate those specifications. Finally, direct links will improve the experience when using Smartsheet across multiple browser tabs. When you log back in or refresh a browser tab, rest assured that each tab will continue showing the appropriate Smartsheet item. Beginning on the release day, we will no longer support tabs directly in Smartsheet. Instead, the introduction of direct links will make it easier than ever to use Smartsheet across multiple browser tabs. Toggling between your work will be faster because each item will only need to be loaded once. And those of you who like keyboard shortcuts will have the option to use them for jumping between your Smartsheet items. Even if you prefer to use a single browser tab, the shift from Smartsheet tabs will benefit you. We’re freeing up more vertical space on the screen for your work. And you’ll now be able to use the browser’s forward and back buttons when navigating in Smartsheet. 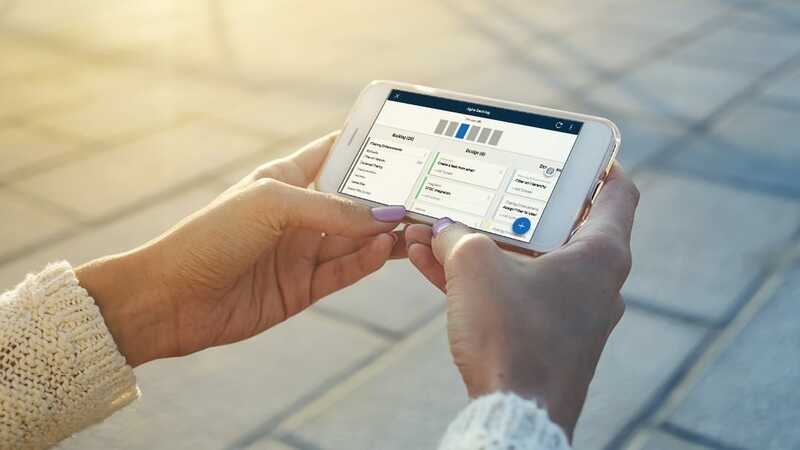 As we prepare to roll out these changes, we’re continuing to work on additional ways to improve the Smartsheet user experience. I want to take a moment to tell you about column descriptions, a new capability we just released. When you want to explain or add instructions for a column in your sheet, you’ll no longer need to use the top row to do so. Keep your sheet clean and add a description in the column’s header instead. Your team will then see a tooltip icon they can hover over to view the description. The decision to change our interface is never one that we take lightly, and the upcoming update is the biggest that we’ve ever implemented. The release will be the culmination of many months of conversations with customers, extensive research and testing, and repeated refinements to the new experience that I’ve discussed in this post. We know that many of you use our work execution platform every day, and we’re committed to ensuring a smooth transition for our customers. Ultimately we’re confident that by helping you access, organize, and share your work more efficiently, these changes will empower you to focus more on the work that matters. You can view frequently asked questions about the navigation changes in the Smartsheet Learning Center.